Much human suffering and devastation in the aftermath of Sandy. Another victim was a shul in New York as their Sifrei Torah were water-damaged. Click here for article and picture. 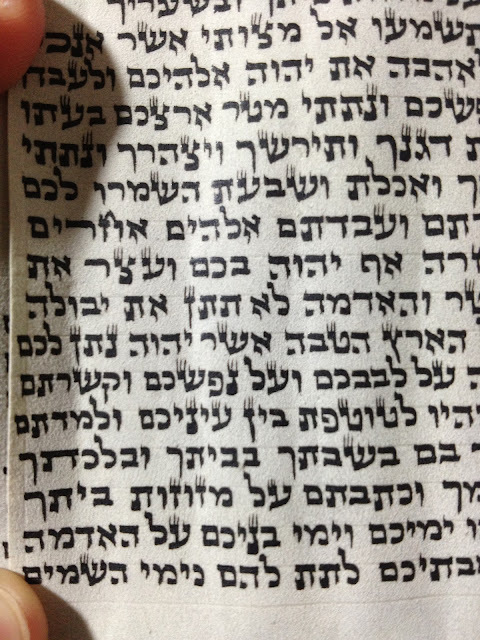 Is this Dalet of אחד a chashash for kaf peshuta requiring a tinok according to yalkut HaSofer? 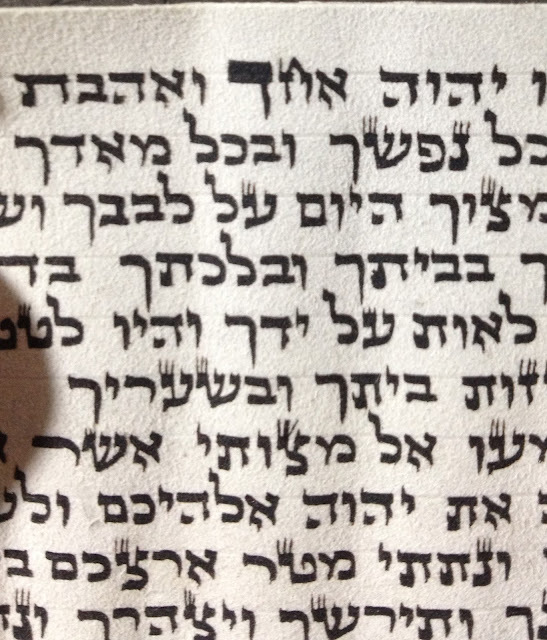 To me the כ of כימי looks like a נ when comparing with size of Kafim and nunim in this mezuza. Does anyone think a tinok should be asked? Navi with pasulim or Chumash? What's better to read from when leining the Haftorah. Navi written on Klaf that has in it pasulim or from a Chumash? Please forgive my horrible drawings! The kuf on the far right is supposed to be a normal Kuf. They asked if they would erase the part that I made in yellow and would add in the bottom part of the Kuf if this would be a problem of chok tochos. R' Shammai Gross had this shailo and was in sofek about it. He has 2 reasons why maybe it's ok. First of all he said how the ois looks now l'maseh the person could make the gag long and have place to write in the line of the Kuf and still have it be within that space. If the person at this point could do that (really they can't though) then it shouldn't be a problem of chok tochos to take away from the bottom. The other possibility he said that if the ois on the far left would be kosher then also to erase the bottom part would not be a problem of chok tochos since as it is it's "kosher" to be a Kuf. From my understaning Ksav Velish is not exactly the same as Ksav Sefardi. 2 letters that seem much different between the two is ח and ך. Ksav Vellish these 2 letters are very similar to way they are on this screen. A few questions: 1 Why do many call all Sefardi Ksav by the name "Velish" if they are not truly the same thing, besides the fact that vellish is a form of Sefardi i.e. it is Sefardi but not necessarily vise versa that all Sefardi is velish? 2 Do sofrim write authentic Vellish today? 3 Why does Ksav Sefardi not follow Beis Yosef (or at least it is heavily influenced by other sources to the extent that there are sometimes conflicting views in the details of writing of many of the letters? ( I am sure this has many answers, I assume that it has to do with the fact why the Rambam and Shulchan Aruch (Beis Yosef) did not write the laws of writing of the letters in their code of Jewish Law.